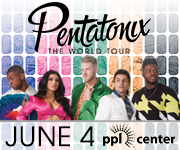 Hershey, Penn. 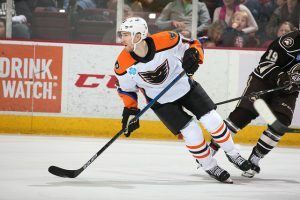 – The Lehigh Valley Phantoms could not find the tying goal on a late 5-on-3 opportunity thus allowing the Hershey Bears to escape with a 2-1 win on Saturday night at Giant Center. The intense game was befitting of the heated rivalry and featured a number of skirmishes. Consecutive penalties by the Bears provided Lehigh Valley 83 seconds on the two-man-advantage but the Hershey penalty kill pushed through while Bears goalie Ilya Samsonov made a couple of important stops to preserve the win. In total, the Phantoms had at least one extra man on the ice for the final 3:06 of the game. 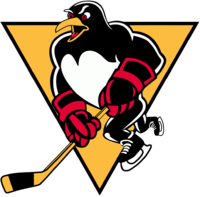 But the team that had just scored a season-high seven goals one night earlier in a wild win at Bridgeport found the offense harder to come by in their next engagement at Hershey. Branden Komm turned aside 31 Hershey shots in an outstanding performance between the pipes, albeit on the losing side of the sheet. 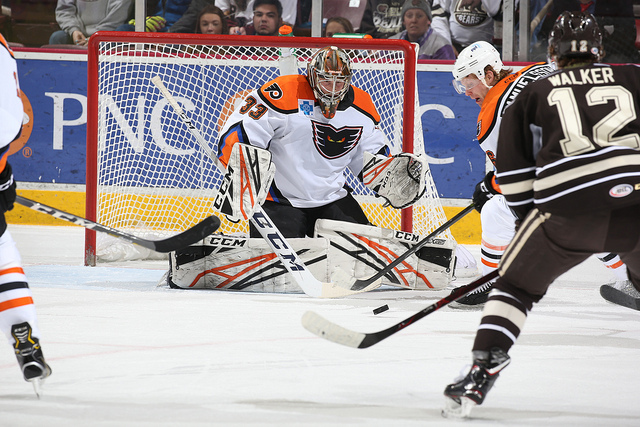 Ilya Samsonov’s 21 saves was enough for the Hershey win. Carsen Twarynski (6th) scored in the second period for Lehigh Valley on a give-and-go with Mark Friedman just moments after Mike Vecchione had dealt a big check on Hershey’s Mike Sgarbossa. The team engaged in one of their several scrums immediately after the goal. 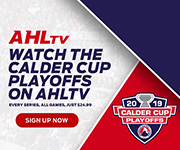 Hershey opened the scoring in the first period with Nathan Walker’s 2-on-1 goal in the first period on a connection from Aaron Ness. They stretched their advantage to 2-0 on Ryan Sproul’s fluky goal from behind the cage on a bank off the back of the leg of Komm. 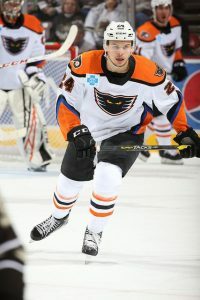 But the 27-year-old netminder, who had just picked up his first career AHL win a week earlier, turned in a sparkling performance with a number of big stops to keep the Phantoms within range of a comeback. 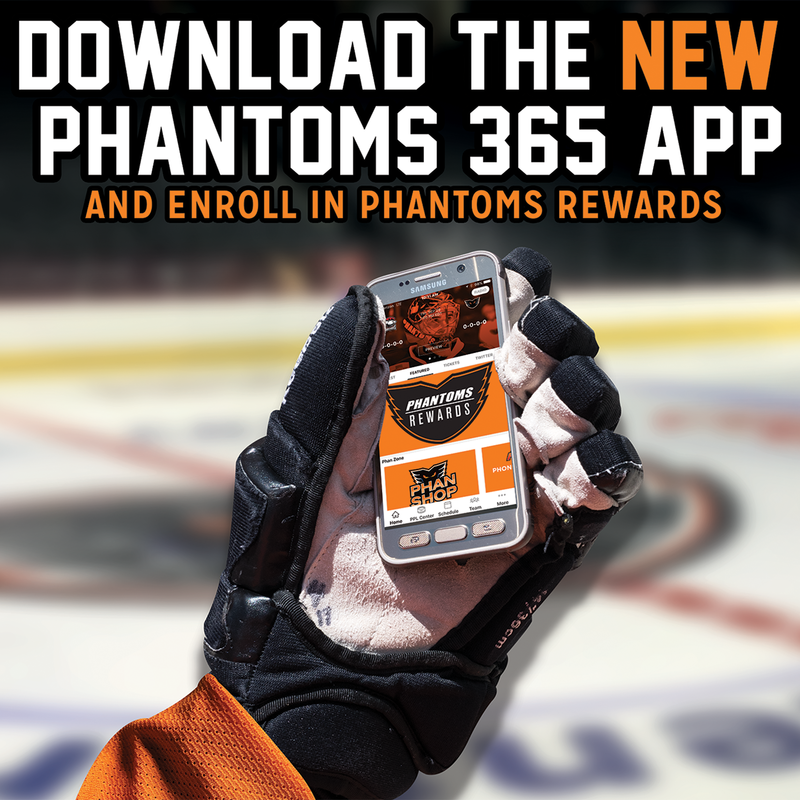 The improved Bears have inched closer to the Phantoms in the season-rivalry series which the Phantoms still lead 5-4. Lehigh Valley is off for a few days before their next game on Friday night at the Utica Comets. 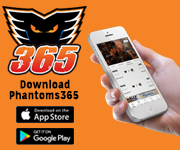 The Phantoms return to PPL Center on Saturday night and Sunday afternoon for consecutive showdowns with the Hartford Wolf Pack, AHL affiliate of the New York Rangers. 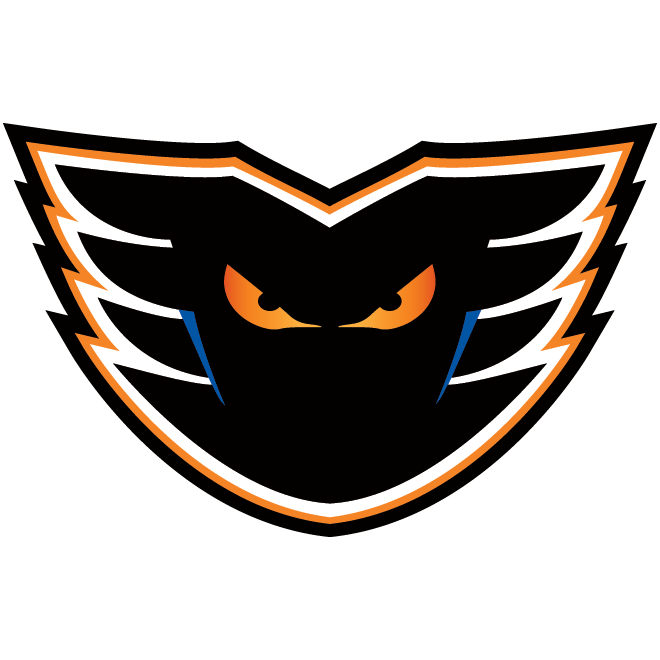 Sunday’s 3:05 p.m. tilt features a Phantoms wall-cling giveaway for the first 2,000 kids in attendance presented by PSECU. 1st Period-1, Hershey, Walker 11 (Ness, Lewington), 8:21. Penalties-Goulbourne Lv (slashing), 17:36. 2nd Period-2, Hershey, Sproul 6 (Ikonen, Whitney), 3:23. 3, Lehigh Valley, Twarynski 6 (Friedman), 8:19. 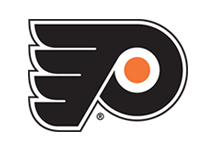 Penalties-Friedman Lv (cross-checking), 4:13; Vecchione Lv (unsportsmanlike conduct), 8:19; Barber Her (unsportsmanlike conduct), 8:19; O’Brien Her (roughing), 8:19; Myers Lv (misconduct – abuse of officials), 13:02; Weise Lv (slashing), 13:02; Palmquist Lv (holding), 19:01. 3rd Period- No Scoring.Penalties-de Haas Lv (delay of game), 0:28; Samuelsson Lv (fighting), 8:25; Malenstyn Her (fighting), 8:25; Bailey Lv (roughing), 9:13; O’Brien Her (roughing), 9:13; Sgarbossa Her (roughing), 9:13; O’Brien Her (boarding), 16:54; Lewington Her (high-sticking), 17:32. Shots on Goal-Lehigh Valley 5-7-10-22. Hershey 12-12-9-33. 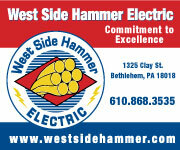 Power Play Opportunities-Lehigh Valley 0 / 4; Hershey 0 / 5. Goalies-Lehigh Valley, Komm 1-2-0 (33 shots-31 saves). Hershey, Samsonov 10-11-1 (22 shots-21 saves). Referees-Jason Williams (18), Ryan Jenken (24). Linesmen-Bob Goodman (90), Tom George (61).